Since Bonterra’s founding in 1987, organic farming has been the first step in our winemaking process. We’ve always believed the important relationship between vineyard health and grape quality leads us to expressive, transparent wines. But with the planet’s temperature on the rise, we wanted to discover how the same agricultural practices that produce America’s favorite organically farmed wine could also help restore a healthy carbon system. In partnership with Pacific Agroecology of Davis, Calif., we conducted a study in 2017 – 2018 to discover how farming choices affect organic carbon storage in soil and above-ground plants. The study’s findings indicate that organic and other types of regenerative agriculture have a positive impact on soil health, and encourage us to continue exploring the dynamic relationship between soil and climate resilience. Researchers examined 108 individual soil samples and 507 biomass measurements from 13 vineyards in Mendocino County. Vineyards studied are home to vines up to 30 years of age, growing 16 distinct grape varieties. Nine of the vineyards were farmed with organic methods, three with Biodynamic® methods, and one with conventional methods. Categorized by farming method, the samples and measurements were reviewed by researchers, who to measured the contribution to carbon storage of soil organic matter in vineyards, woody biomass in vines above ground, and both soils and plants in uncultivated, native wildlands around the vineyards. Sampling method: Using a hand auger, soil samples were taken from the top 30cm of soil (the layer most affected by farming practices, such as plowing, tilling, and cover cropping) from vineyard blocks of varying topographical character. Data from these samples then passed through a Geographic Information System (GIS) model to extrapolate SOC storage across the landscape. Farming practices adopted widely in the 1960s that permit the use of synthetic non-organic herbicides, pesticides, and fertilizers for management of crops and competitive vegetation. Agricultural practices that exclude the use of synthetic non-organic inputs—such as herbicides, pesticides, and fertilizer—in favor of fostering the natural vitality of the farm through integrated pest management, cover crops, and building healthy soil. Learn more at ccof.org. Formally defined in 1924, an approach to organic cultivation that views the farm as a living organism where plants, animals, and humans interrelate as members of an intricately connected ecosystem that follows the cycles of nature. Learn more at demeter-usa.org. Total carbon storage in vineyards is substantial, averaging 51,481 lbs. per acre—with 89% of the total stored as soil organic carbon (SOC); the remainder can be found in above-ground plants including vines. Vineyards farmed with organic and Biodynamic methods stored 9.4%-12.8% more SOC per acre, respectively, than the conventionally farmed control vineyard. These findings suggest a positive relationship between regenerative farming practices and soils’ capacity to hold beneficial carbon underground. 41,000 lbs. 45,200 lbs. 46,300 lbs. The study also reviewed soil and above-ground carbon stores in Bonterra’s undeveloped wildlands, which comprise nearly half of all land we own and reflect our commitment to land conservation. Results showed that total carbon storage in wildlands—both in soil and above-ground plants—was the highest among all sites studied, indicating that continued conservation efforts have both near- and long-term benefits..
Uncultivated wildlands are an important part of a regenerative approach to enhancing farm and climate health, and are a natural complement to practices like organic and Biodynamic farming. 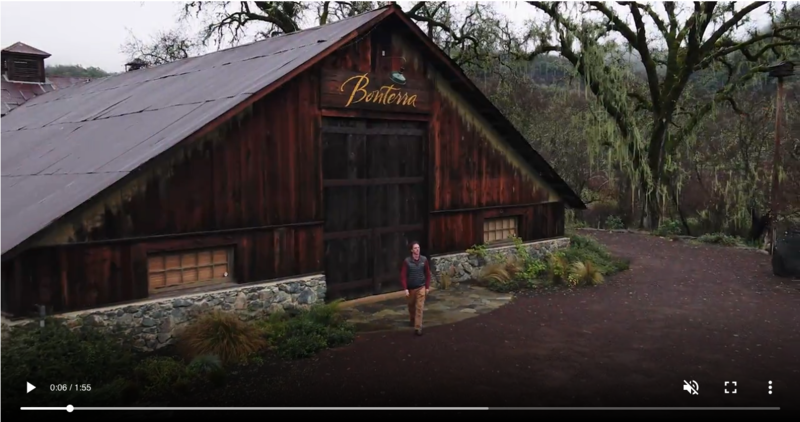 We not only love the oak trees, ferns, and grasses that surround our vineyards–we believe that conserving them is critical to a beneficial overall carbon “budget” for Bonterra. We’re excited to share results that indicate organic and Biodynamic farming techniques may help soil more effectively store carbon and, in turn, help slow the pace of climate change and rebalance the planet’s carbon system. Our efforts to understand this relationship are part of Bonterra’s committed to farming practices that build on the natural vitality of our planet. Facilitating and sharing important research is just one way we can make it possible for others to join us on this path. Source: Morandé, J.A., M.G. Vaghti, J.N. Williams, J. Medellin-Azuara, & J.H. Viers. 2018. Carbon Inventory and Annual Increment Analysis of Vineyard Blocks and Adjoining Wildlands of Bonterra Organic Vineyards. Pacific Agroecology LLC Project Report. Davis, CA. 25 ppd.